As with any school, the day started with some classroom time. This is probably one of the most important aspects besides on-track instruction. The first day consists of about an hours worth of instruction where every student, no matter your level, is educated on all things track. What an apex is, what trail braking is and what each persons experience is. We were lucky enough to have Bob Bondurant himself stop by to make sure we’d have fun and not wreck his cars. After the classroom we moved onto exercises in preparation for all-day track work following on day two. The first exercise was a refresher course for heal-toe downshifting. We used a short straightaway on the Bondurant track for a quick 40-60 mph zone ending in a braking and down shifting section. While both the cars in my garage are set up for heal-toe down shifting you’ve got to be going at a pretty good clip to actually use it. As a result, during the year and leading up to a racing school I usually fall out of practice, so I’m glad we were able to brush up on our skills. The exercise started at one end of the short straightaway and allowed each of us to get up to speed before the pre-set braking cones that also indicated our down shifting points. For those of you that might be unfamiliar with heal-toe down shifting, it is simply a quicker and more efficient way to downshift while carrying higher speeds on track. The action works like this: as you are braking in preparation for a corner the inside part of your foot stays on the brake pedal (applying pressure) while the outside part rolls over onto the gas pedal for a quick blip of the throttle to match the revs. Matching revs is important when down shifting even at normal street driving speeds simply because, when you downshift the revs swing way up while the car is being slowed down so matching them with a quick blip of the throttle will prevent strain on the engine and potential unintentional redlining of the revs. After about half-an-hour I felt pretty proficient and was ready for some track work. 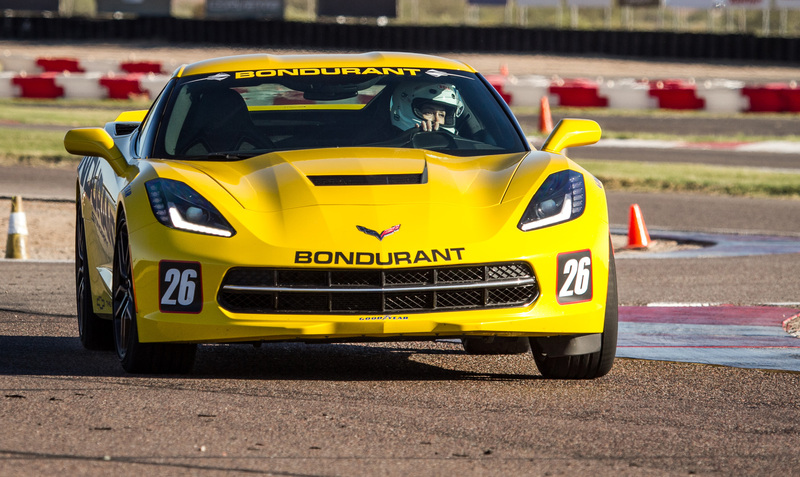 The last four hours of the day consisted of track work and lead-follow sessions on the Bondurant track. The instructor took us around in order to get familiar with it. He would go at a slow crawl to show us each individual turn-in, apex and exit point of a corner. He would demonstrate braking, and trail-braking, acceleration points as well as down shifting and up shifting sections. An apex is the inner most part of a corner. Hitting the apex allows the vehicle to keep the straightest line through a corner in order to maintain higher speed. Hitting an early or late apex will determine how far off track you’ll go in the exit or if you’ll miss the exit point entirely. Sometimes there are double apex corners, further complicating the line and where you’re supposed to be in the corner. For the most part, corners are pretty straightforward with a turn-in, apex and exit point. Making the corner as straight as possible will further help in carrying more speed. Another important part of corning on track isn’t how fast you go, rather it’s how smooth you are in braking before and during the corner. Typically it isn’t smart to brake while cornering a car at speed, but I’m not talking about massive ABS type brake pressure, just easing off slowly through a corner up to the apex to continue to slow the car down. Leaving the majority of your braking later before turning into a corner usually results in faster lap times if you can properly use trail braking to help continue to slow the car down through the corner. As you near the apex your braking foot lifts slowly until it’s time for acceleration. Trail braking is a good tool to use, helping to get faster lap times but should be used correctly. If you slam on the brakes in the middle of a corner the car will most likely react in a negative way. After a decent amount of time crawling around the track, the instructor then drove at speed progressively getting faster with each passing lap. It’s amazing to be in the car and experience the ease and skill an instructor has when taking you around. With three of us in the car he would toss it (Cadillac CTS V sedan) through corners one-handed with the other pointing and guiding us through each corner. The car just did whatever he asked and we loved every minute of it. With a couple of hours left we were let loose in our Stingrays to figure out each corner in addition to the cars capabilities. The Stingray has completely opened my eyes and changed my perception of American muscle. I have a new appreciation for made in the USA big motors with lots of instant torque. The Stingray is for sure one of the best cars for the money currently out today. On the Bondurant track, the Stingray yearned for more stretching room. With short straightaways and tight corners I picked up on its desire for long pavement and sweeping high-speed corners. Acceleration is insane. Period. Torque is so instant and 0-60 mph takes less than four seconds making the one who pilots it giggle and screech in a completely insane manner. If you ask it to go it goes, immediately. If you ask it to turn it does, precisely. On the Bondurant track we held third gear most of the time. Getting up to speed takes some time especially when the last time I went on this track was 10 years ago and my last school was in February. The Stingray is patient while waiting for you to get up to speed and does so in the best way possible. The first time I really stepped on it I was thrown back in my seat and came away with a stupid silly grin on my face. Day two consisted of just track work, but on a larger track. The instructor took us around in the CTS V sedan and showed us the ins and outs of the track. “Turn in here, hit your apex and you’ll already be looking at your exit point then accelerate, up shift to third gear, fourth gear, braking cones downshift three, two, then turn in…” That’s just an example of the kind of detailed instruction provided through each and every corner, straightaway etc. One of the biggest issues anyone has coming through these schools is vision. No, not the kind you need glasses for, but the kind where you don’t look far enough through the turn or down the track anticipating the next braking point, turn in, apex, exit etc. It’s honestly kind of scary to look through a corner at an exit point while you are turning the wheel. It seems logical to look at what’s in front of you then look for what’s ahead. That’s the problem with street driving; we get so accustomed to looking at the person’s bumper in front of us rather than ahead and beyond. When you think about it, looking where you want the car to go makes sense, but not when you’re heading for a tree. Instinct tells us to look at the tree, but professional knowledge and instruction tells us to look where you actually want the car to go, not at the object you don’t want to hit. At one point, the instructor noticed I was looking too far ahead and missing some important parts of a turn. There has to be that special balance between too much and none at all. By mid-day I was looking exactly where the car needed to be and it would follow. Probably the most helpful part of the day was following the instructor around the track. He would guide one of us around for several laps, showing us braking, acceleration, turn-in, apex, and exit points. Having this kind of help is especially possible with a three students to one instructor ratio Bondurant offers. The less people an instructor has to teach, the more time they can spend helping you improve. Next to following the instructor, it was also a huge advantage having him sit in the passenger seat and explain how to improve a certain section or how late I can leave my braking. In the below video I went for a couple of laps with the instructor helping me through the more difficult parts of the track. At each school I attend, I’m all about getting a perfect line around the track rather than top speed. That doesn’t mean I’m slow, I’m just not about to wreck a car that isn’t mine so that I can show off or impress someone. My dad goes with me to every school and he’s always been faster than me. He’s been doing this longer and has a lot more practice than I do, so I don’t try to compete with him. I compete with myself. With this school I feel I pushed my limits pretty good. I went faster in corners I know last year I wouldn’t have. I braked later, accelerated quicker and took corners faster than I’m used to. And turns out, it wasn’t scary. Simply trusting the car is another obstacle that most people including me at times struggle with. And trusting doesn’t just mean thinking (or hoping) the car will brake to avoid another, rather it means trusting the car to carry you around track at high speeds and know that it wont spontaneously spin out or suddenly aim for a stationary object. Know that if you ask it to turn it will, if you force it, it will probably bite back.